One of the joys of working for myself is that I spend so much more time with my books. We dedicated much of last Saturday to purchasing second-hand books, and much of Sunday to making space for them by removing other books. 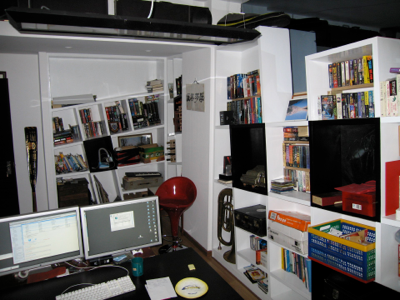 The result is a leaner, tidier book collection, and the reclamation of an entire shelf. Some of the books that will be leaving the house are those that we have, somehow, acquired two copies of: The Once and Future King (see The search for perfection), the complete works of Tennyson and Alan Hollinghurst’s Stranger’s Child were all in this category. Others have been read, and found wanting, such as The Ginger Man (a dreary book about dreary people), Fingersmith (enough with the plot twists! Enough, I say!) and The Story of O (<snore>). Still others have been mined for information that was useful at the time, but for which we have no further need, mainly deadly music-related tomes left over from Giant Bear’s degree. There is a final category of books bought on a whim, and which must be reassessed on a case-by-case basis when one is feeling less frivolous. This group includes some of the more obscure works in our collection, such as Anatole France’s book Penguin Island and G.K. Chesterton’s absurdist anarchist novel The Man Who Was Thursday, which I was forced to read on the Eurostar after the only other book I had packed was stolen. A thief of questionable motive picked through my handbag, spurning my purse, passport and ’plane tickets to Shanghai in favour of my beige hardback copy of Stella Benson’s bonkers satirical allegory I Pose, which I was a mere sixty pages or so into. The novel contains only two real characters, the Gardener and the Suffragette (Stella Benson was one or the other at various points in her life) and I have been unable to replace it, making this one of only two books that I have left unfinished through circumstance rather than choice. He or she also stole my bookmark. 1.iv.The Thornbirds. This was condemned to death by unanimous vote. Mother was reluctant at first, because of Richard Chamberlain. He’s obviously as gay as the day is long, but it didn’t seem quite the right moment to say so (esp. as she would probably have said ‘oh, really, dear? How can you tell?’, or perhaps ‘yes, dear. But, you know, at this time of year the days are getting shorter again, aren’t they?’ Wretched woman). As an elegy, Father read aloud the bit where the father and son die in a bush-fire, in a small, sarcastic coming-together of fathers and flames. If any of us had needed a final nudge, the utterly stupid moment when the son is crushed by a giant pig would have done it.